It's Friday again! Day-by-day goes by so quickly ... And cheese cake bento was made for this Friday. I was thinking to buy some cakes later at the bakery so the kids could have some too for this afternoon. The 'cheese cake' was made from 2 rice balls stuffed with tuna curry inside, egg slices on the top for the 'cheese' with a half of sweetened red cherry. 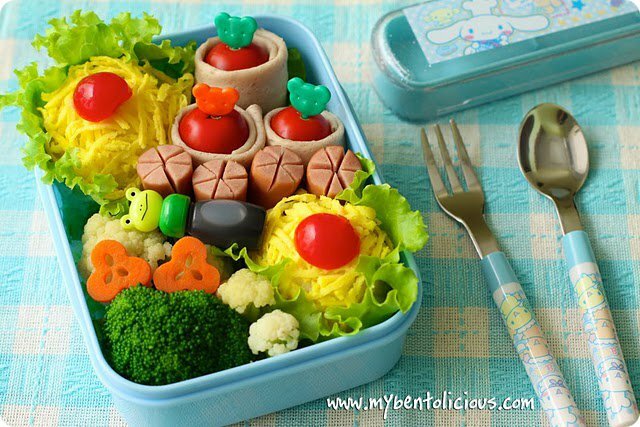 And the other foods inside this bento : cherry tomatoes wrapped in ham, sausages, cauliflowers, broccoli, and carrots. Anncoo gave me 'I Love Your Blog' award. She has a wonderful blog for her passion in cooking and baking. I enjoy her blog a lot. Since this award has no rules, I would like to give this award to all of my wonderful blogger friends. I will notify all of you on your blog and please pick the award up here. Wow, Lia! Those cheese cakes are so cool... I really was tricked into believing that was grated cheese on top! Amazing! I also love the ume blossoms with the teeny holes... you got new cutters? Your bento makes me so happy; they are always so colorful and bright! Don't even need to eat them, that's how strong your bento powers are, hehe! @gamene : Thanks a lot for your kind words Megan! Yes, the cutter is new ... I forgot to take the picture, maybe next time I will poss it. @sherimiya : Thanks a lot Sheri! Your comment always makes me smile. Yes, I've got new cutter to play with hehehe ... But I'm still doing the 'straw trick' for the tiny holes. @Melanie : Your welcome Melanie! I would LOVE to see you make a real cheesecake! hehehe I bet it would be superb! This bento box is chock full of yumminess. I follow sherimiya about the ume blossoms, I've never seen them before. So cool! Hi Lia, Thank you for the award. I feel very honored that someone with your bento AND blog skills would bestow me with such an honor. like your idea of the 'cheesecake onigri' - so cool. Hi Lia, You deserve this Award. 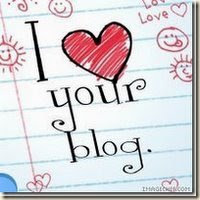 Anyone who visit your blog will definitely love your blog at first sight. WOW! Another beautiful colourful bento ;) 看到就舍不得吃！I love the new cutter on the carrot. That's a good idea for cheese cake! :) Before I read how u did it, I was wondering how to make such cute little cheese cakes. LOL! Thanks for the award, will post in my blog soon. Tks for the award Lia Chen. I lov the carrot too, they look so nice with the tiny holes in the middle. @hapabento : Thanks a lot Debra! I found very hard to push myself to do the baking things or I'm to lazy and always make excuses to start hehehe ... And oh no! I'm not that great in bento compare to you, I consider you as one of my bento 'guru'. Enjoy the award and have a nice weekend Debra! @Vanessa : Thanks a lot Vanessa! You are so sweet :) Have a nice weekend! I know you are busy and have a lot going on with coming home from your sister. I thought I might implant the idea of you making a bento book in the future?? I'll be the first to buy a couple copies! hi lia chen,great to know ur blog fr Rachel Hei. ur bento series so awesome. Aw Lia, let me hug you again! Thanks for the award ^-^ Be sure, I love your blog, too! Wow, looks so delicious Lia. I really like the cute box and the matching fork and spoon! @Amaaris : Thanks a lot Ama! Thank you... thank you for another award. Love the color combination & thanks 4 the award. Thanks Lia for the award!! I love the ume carrots..I see that you got a new cutter. cutie. : ) have a wonderful weekend with your kids. Love your new cutter! Your bento are always amazingly colorful and yummy! @Kids Dream Work : Thanks a lot for your nice words! Always happy to be friend with you. Have a fun weekend!